Last week I posted this article on my other blog Outside Economics and many people enjoyed reading the article. I thought I would repost it here so you would have the latest on what is going on in Europe and what could happen here in the U.S.. If you like the article please subscribe to Outside Econoimics for future great articles and make a comment below. Thank you. The great recession has left its mark on many of us in so many ways it is hard to understand them all - perhaps similar for generations before with the Great Depression. One major mark is in banking. The Great Depression produced the FDIC which insured customer deposits and help provide a level of financial security to the banking system. Now Europe and the European Union has lead the way with a “bail-in” concept where depositor bank accounts are used to shore up the troubled bank, thus taking the tax payers off the hook for failed banks. This week Austria put this to the test. 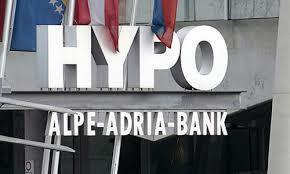 Hypo Alpe Adria (HETA) collapsed under the weight of bad loans. The bank is located in the Province of C arinthia, which has mostly controlled the bank for the past year, when it first started having problems. In taking on the obligation of this bank Carinthia is worried that it may cause the Province to file for bankruptcy as well. As well as a harmonization of the maturities of all eligible liabilities to 31 December 2023. Subordinated liabilities is simply another term for depositor’s money in the bank. In the typical banking arrangement the bank’s assets are the loans on the books, while their creditors are all the depositors. The exact opposite of personal or business finance, where loans are liabilities and cash deposits are part of their assets. This sort of “bail-in” can cause a lot of panic in finance world, simply because people losing their deposits can demonstrate some serious concerns about how well a bank is operated. Clearly an uncharted path. Some concerns exist over the legal as well as the practical aspects of the “bail-in” concept. This makes the creditors of the bank more responsible for how the bank is run. If there appears to be any problems creditors simply will not lend money to a bank or if they do they will demand a much higher risk premium. This will of course raise interest rates for everyone. Corinthia attempted to remove the guarantees by purchasing the bonds at a discount from the bond holders, primarily Commerzbank, AG and Pacific Investment Management Co., (PIMCO), who rejected this offer last month. The creditors are demanding that Austria pay up if Carinthia cannot pay. In either case the depositor’s monies are gone. This rule was put into place after the Great Recession to help relieve the burden on the tax payers for bailing out banks. The results are yet to be determined, but like every regulation there are unintended consequences. Some of those consequences maybe, higher interest rates, depositors being extra cautious where they deposit their paychecks, fewer loans made to small or medium size businesses, bankers will be unwilling to take risks with business owners on such loans. You maybe asking yourself why does this bank in Austria matter to me? Here is the short answer; YES; the United States banking regulators have adopted a similar rule. When a bank fails the regulators can force a bail-in of depositors monies to right the ship. Many people do not realize or understand that this can and most likely will wash up on the shores of America as soon as we have another major financial melt-down. Watching how this precedent action plays out may be an example of how it will work here in the States. I am clearly not suggesting that you take your money out of the banking system and hide it under your mattress, that would be foolish. Also I think that U.S. banks operate with safety and soundness regulations that help protect depositors money. This maybe one reason why gold and silver has shot up in price this past week. People still perceive precious metals as a safe haven for currency problems. People should be more concerned with the return of their principal than the return on their principal. For marijuana growers and retailers in the states that have legalized the drug for recreational or medical use, money and banking are perhaps the most vexing challenges of doing business. Piles of cash accumulate in back rooms and safes, making the businesses, their employees and their customers a target for robberies. Businesses often have no access to business loans or regular lines of credit. Many say they struggle to even keep a checking account open to pay their employees or electricity bills. Legal sales of marijuana have already reached $2.6 billion so far this year. Most estimates predict sales from medical marijuana will likely reach $3 billion by the end of 2014, up from $1.5 billion in 2013. 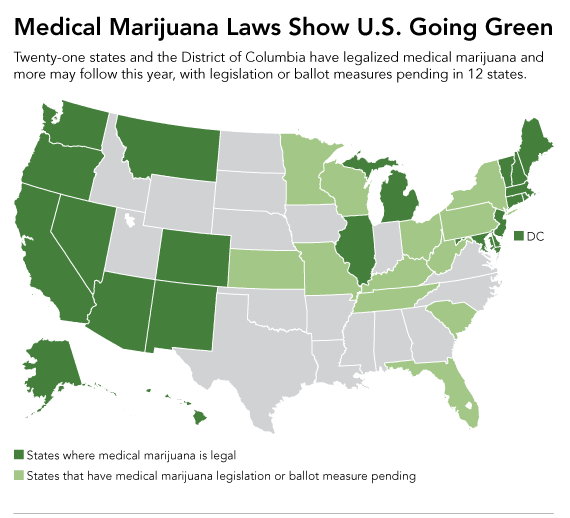 Marijuana can be grown legally in 23 states and the District of Columbia; and another 11 states have limited legal access, often for research purposes, according to the National Conference of State Legislatures. A recent Huffington Post article cited studies that predict that legal marijuana sales could bring in between $7.4 and $8.2 billion in revenue by the year 2018. Under federal statues, the use, possession, sale, cultivation, and transportation of cannabis (marijuana) in the United States under federal law is illegal but the federal government has announced that if a state wants to pass a law to decriminalize cannabis for recreational or medical use they can do so, but they need to have a regulation system in place for cannabis. Cannabis is listed as a Schedule I substance under the Controller Substances Act of 1970, the highest classification under the legislation. This means that the substance has been decided by the federal government to have both high abuse potential and no established safe medical use. However the stimulation or boost, selling and taxing marijuana will provide to both the state and national economies has become very evident to lawmakers. Take the state of Colorado that has implemented selling recreational marijuana. On the first day of 2014 alone, shops opened across the state totaled over $1 million in sales, according to multiple sources. Combine that with a nearly 29 percent tax rate statewide, and you can calculate what the state is anticipating in revenue. The Colorado State Department of Revenue reported that as of July 2014, the state sold $29.7 million worth of recreational marijuana which was slightly higher than $28.9 million worth of medical marijuana sold in the same month. While marijuana is illegal in most states and is prohibited under federal law, the Obama administration said last summer that it would allow Colorado and Washington State to move ahead with legalizing the drug for recreational use. In an interview with The New Yorker, President Obama said that despite his misgivings about marijuana and the push for broader legalization of the drug, it was important that Colorado’s and Washington’s experiments go forward. “It’s important for society not to have a situation in which a large portion of people have at one time or another broken the law and only a select few get punished,” he said. A bipartisan effort to help marijuana entrepreneurs is emerging. The House amendment passed July 16th (HR5016) that should help marijuana businesses get banking services in the 23 states where marijuana is legal in some form. Specifically, the amendment prohibits the Treasury Department from spending money to penalize financial institutions that serve legal marijuana businesses. It passed 231 to 192. Last May, the House passed another appropriations bill amendment forbidding the Drug Enforcement Administration from undermining state medical marijuana laws, with 219 members voting yes. Also passed were two measures to keep the DEA from interfering with state hemp production or research programs. What’s making marijuana one of the few issues Democrats and Republicans can agree on? At least as far as the banking amendment, it’s partly about public safety and transparency. Since FinCEN’s guidance went into effect in February, 2014, a reported 105 individual financial institutions from states in more than one third of the country engaged in banking relationships with marijuana related businesses. From FinCEN’s perspective, the guidance is having the intended effect. It is facilitating access to financial services, while ensuring that marijuana-related business activity is transparent and the funds are going into financial institutions responsible for implementing appropriate AML safeguards. The taxation of marijuana production and sale has tempting budgetary implications for Congress and this country. The 2005 Budgetary Implications of Marijuana Prohibition by Jeffrey A. Miron, Visiting Professor of Economics Harvard University, reported that legalization would save $7.7 billion per year in state and federal expenditures on prohibition enforcement and produce tax revenues of at least $2.4 billion annually if marijuana were taxed like most consumer goods. If, however, marijuana were taxed similarly to alcohol or tobacco, it might generate as much as $6.2 billion annually. According to Gallup 58% of Americans support ending marijuana prohibition, and Colorado and Washington State has already passed historic ballot initiatives to tax and regulate pot. When it comes to marijuana in the United States, it is no longer a question of when, but how it will be legalized. Today is the 4th of July the day we celebrate as the day our great country was founded in 1776, when we declared our independence from England. I thought I would write a few of my feelings about our country. I was raised the youngest of seven children in Los Angeles, California. My parents met during World War II in Utah. My father was a photographer in the Signal Corps and in charge of the photographic departments on several bases west of the Rockies. My mother worked in one of those departments in Ogden. I was raised with a great love for our country. My parents took this very seriously. As I learned more and more about our country’s history and founding my love grew. Having read many books on our founding fathers, Abraham Lincoln, and other presidents, I do have an appreciation and love of these great people. When we spend time learning about the good in America we learn to love her. 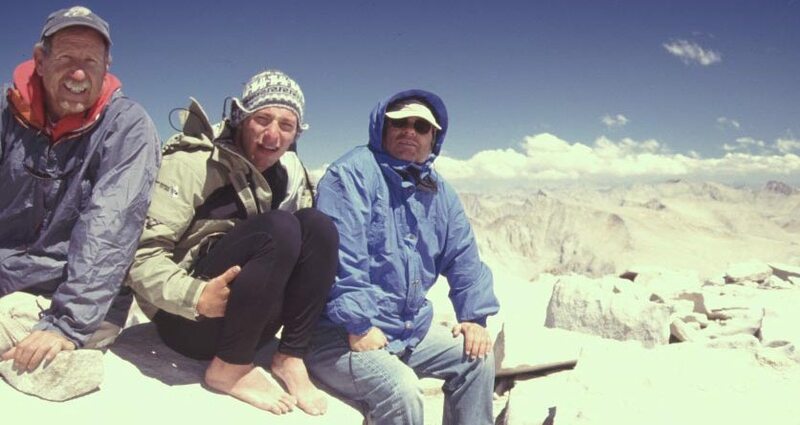 My brother-in-law use to take me backpacking when I was a teenager in the High Sierras. There is no place like the High Sierras in the world (so I am told by the many people we met on the trail from other countries). The time spent there I learned again to love our country and its amazing beauty. I have traveled to many of the other states in the Union on business, and I am always amazed at what a wonderful country we have. It is truly special. I personally believe that God put all the right elements here so a nation could thrive and spread goodness throughout the world. We have a constitution like no other country, with our republican form of government; yes we are a REPUBLIC, not a democracy. This constitution was the first in human history to declare that as individuals our rights came from the God who created us, not from a person or a government. These rights limited the government’s control over our lives and allowed us the freedom to develop ourselves as we chose. We have the world’s strongest best trained military. Now I know many people say we dwell too much on the military or spend too much on the military, etc. I have heard all of that, including we should not be in this country or that country, we should not be the world’s police force – we should just stay home and mind our own business. The reality of being the world’s police force is this, if we are not there to serve, some other super power will be called in to serve. So would we rather have China, Russia, or someone else in those countries? What would be the political frame work they would leave behind? Now I know that not everything is rosy with the military there are a few bad apples that commit crimes, etc. But by and large they are great people who serve and truly bless the lives of the people in those countries. An opportunity to help these struggling countries blesses everyone involved. I have read several histories about the wars America has been involved in, I have visited several cemeteries where hundreds of thousands of soldiers are laid to rest. I have pondered on their lives being cut short by the conflict they were in, with deep gratitude I give thanks for their sacrifice and the sacrifice of their families; I believe that the God of this land has a special place for them. We have an amazing geography wherein we are able to produce food in abundance, like no other place on earth. Very few things won’t grow in America. What a great blessing to produce and eat so many different foods. We have a country where people from other countries can become an American. Becoming an American is a very special thing and I would hope that all people who come would be contributors to this great country and not work to tear it down. We have so many people who wrongfully beat a negative drum that it is sad to see what they are missing. I would ask them to study deeply its history and learn about the people and hopefully they will discover what an amazing great country that God has blessed us with. I could go on with many more things about the greatness of America, but time and space are limited. So I will invite you to find at least five of your favorite things about America and share them with your family and friends this weekend. 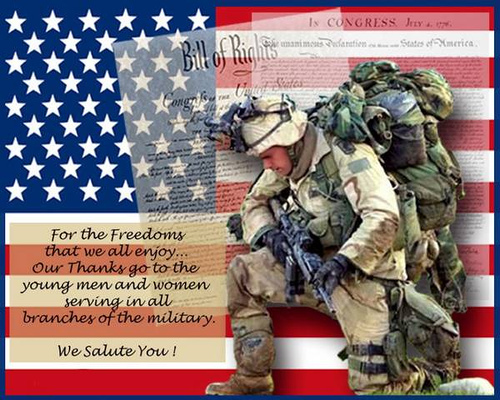 Help others understand why you are grateful to be an American. And always ask God to continue to bless America. Oh - and one more thing we have a great flag - I love our flag - long may she wave! Through monetary awards and the allocation of tax credits, the Community Development Financial Institutions Fund (“CDFI”) helps promote access to capital and local economic growth in urban and rural low-income communities across the nation. Resources for the administration of the CDFI Fund. 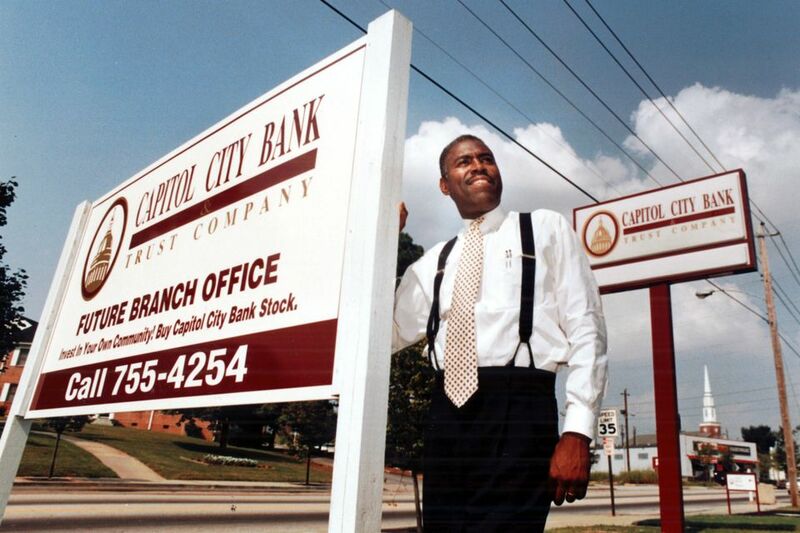 Through its various programs, the CDFI Fund enables locally based organizations to further goals such as: economic development (job creation, business development, and commercial real estate development); affordable housing (housing development and homeownership); and community development financial services (provision of basic banking services to underserved communities and financial literacy training). Applications are accepted annually through each of the CDFI Fund's monetary and tax credit programs. Hope Credit Union is an example of the CDFI Fund’s programs creating economic growth in communities often considered too risky for mainstream financial institutions. 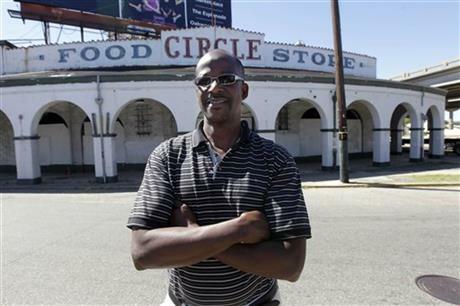 Circle Foods opened in 1939, was New Orleans first African American-owned and operated grocery store. In 2005, Circle Foods was heavily damaged by flooding in the 7th Ward caused by Hurricane Katrina. For years, the owner tried to secure financing to renovate and reopen the store, but was unable to find any willing lenders and investors. That changed in 2012, when Hope Credit Union, a leading CDFI serving the Mid-South, provided Circle Foods with financing through a partnership that included the City of New Orleans’ Fresh Food Retail Initiative. Thanks to Hope Credit Union, a new 22,000-square-foot Circle Foods reopened earlier this year and is now providing access to fresh produce and affordable food in the 7th Ward. In addition, the grocery store has created 62 new jobs, the majority of them filled by people who live in the local community. The CDFI Fund also strives to serve urban and rural areas proportionately. Over the last 10 years, it is reported that 25 percent of CDFI projects have been in non-metropolitan areas. Made more than 24,000 loans and investments totaling almost $2 billion. To learn more about the CDFI Fund programs, visit their website at www.cdfifund.gov. What is your story - have you used the CDFI before? or even heard of it? Is this a government service that you may look into or use? Let us know. 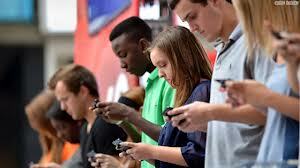 Generation Y consumers primarily look for mobile services and rewards programs when shopping for a new bank, according to a December 2013 study, conducted by Harris Poll among more than 1,000 U.S. adults. The study found that Generation Y adults (those between age 18 to 34) with a checking account are more likely to say mobile banking is at least somewhat important when choosing a bank (78 percent) than those in the 35-54 age group (66 percent) or those ages 55 and up (44 percent). Members of Gen Y are also more likely to believe customizable rewards are at least somewhat important (86 percent versus 73 percent of 35-54 year olds and 63 percent of those ages 55 and up) and that cash back options are at least somewhat important (88 percent versus 74 percent and 67 percent, respectively). A recognizable brand name is also more important to Gen Y adults (81 percent say it’s at least somewhat important) than it is to those ages 35-54 (68 percent), the study found. While 72 percent of Gen Y adults say banking locally is at least somewhat important to them, roughly one-quarter of those same people who have a checking account but do not bank with a community financial institution say they don’t use one because they don’t believe a community bank or credit union will offer the same benefits they’re getting at their current bank. Additionally, 30 percent of these Gen Y consumers say they don’t use a community bank or credit union because they’ve never thought about it. Are these study results indicative of the U.S. market or does it extend further? In the eleventh annual World Retail Banking Report (WRBR) released in 2013 by Capgemini more than one-quarter of the countries in the WRBR's Voice of the Customer survey reported a decrease of more than 10 percent in the share of customers with positive experiences, a reversal from the prior year when increases of more than 20 percent were prevalent. According to the report, since Gen Y consumers make up anywhere from one-quarter to one-third of the population in many markets, catering to their tastes is a key for banks. "This group's expectations of how banks should serve their customers, particularly via digital platforms, are significantly higher than those of the general population thanks to their prolific and sophisticated use of technology," the report adds. For the first time, the report measured the impact of positive experiences on a number of behaviors linked to increased profits. Specifically, the report found that customers with positive experiences are more than three times more likely to stay with their bank than those who have negative ones. Customers with positive experiences are also three to five times more likely to refer others and purchase another product, the report finds. In North America, Gen Y consumers are significantly less likely to have a positive experience with their bank, the report found. Only 41.7 percent in North America of those between 18 and 34 years cited positive experiences with their bank, compared to 63.4 percent of those of other ages, a difference of 21.7 percent. In other regions, positive experiences for Gen Y lag those of other age groups by anywhere from only 7 percent to nearly 10 percent. This downward shift underscores the challenges banks are facing in meeting the evolving demands and high expectations of digitally-savvy Gen Y customers. The balance between traditional channels and the need to address the Gen Y customers will require a transformation for many banks. The new reality - Banks are no longer a branch or a place where customers go, but a collection of services that take place, anywhere, anytime. An independent consultant can play a valuable role in assisting a bank’s management and board of directors in correcting significant violations of law, fraud, or harm to consumers. It is the policy of bank regulators to carefully consider whether to require an independent consultant in these cases and to evaluate the consultant’s independence, capacity, resources, and expertise and to monitor the consultant’s performance. This is a critical area when a national bank, federal savings bank, or federal savings association is instructed to employ independent consultants as part of an enforcement action to address significant violations of law, fraud, or harm to consumers. The bank regulators evaluate the bank’s assessment of the independence of the consultant to establish that the consultant can perform its work with a high level of objectivity such that the results of the engagement are free of any potential bias and that the work is based on the consultant’s own independent and expert judgment. Any direct conflicts or facts that call into question the independent consultant’s integrity will cause the disqualification of the consultant. Examples of such direct conflicts include the use of a consultant that has previously reviewed the transactions that are to be evaluated in the current review or that has previously assessed the specific policies and procedures related to the violations or practices at issue. In addition to a direct conflict of interest, a bank should consider whether there is the potential for an appearance of a conflict of interest such that the consultant’s objectivity could be unduly influenced indirectly. Address significant deficiencies with banks’ programs related to compliance with Bank Secrecy Act and anti-money laundering laws and regulations (BSA), including reviews of banks’ BSA staffing, risk assessment, and internal controls. The OCC has also ordered reviews by independent consultants of the adequacy of actions already taken by banks to address deficiencies in the BSA programs. Review transaction activity to determine whether banks must file suspicious activity reports (SAR), whether SARs filed by banks need to be corrected or amended to meet regulatory requirements, or whether additional SARs should be filed to reflect continuing suspicious activity. The OCC has ordered similar reviews by independent consultants of banks’ currency transaction reporting. Address significant consumer law violations, including violations of section 5 of the Federal Trade Commission Act regarding unfair or deceptive practices. Banks have also been required to hire independent consultants to identify affected consumers, monitor payments to such consumers, and provide written reports evaluating compliance with remedial provisions in enforcement actions. Perform forensic audits in cases where the OCC has concerns about widespread fraud or systemic irregularities in banks’ books and records. In addition, banking regulators have required banks to retain independent consultants to provide expertise needed to correct operational and management deficiencies rather than to address significant violations of law, fraud, or harm to consumers. By retaining consultants to perform these “functional” engagements, banks gain the additional knowledge, experience, and resources required to address deficiencies identified through the supervisory process. These engagements have been particularly valuable for community banks that may lack the necessary expertise and resources to correct the problems on their own. Proposed mitigating factors to address any potential conflict or appearance of conflict. Any financial relationship, including the amount of fees to be paid, or previously paid to the person or company as a percentage of total revenue of that person or company, and any other financial interest between the bank and the proposed consultant. Any business or personal relationship of the consultant, or employees of the consultant, with a member of the board or executive officer of the bank. 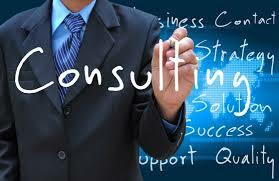 Prior employment of consultant staff by the bank. It is important to remember that no single factor determines the outcome of the regulatory acceptance of a bank’s selection of consultant. It is all the factors collectively that are evaluated with the goal of ensuring that the services performed by the consultant, including its findings and recommendations, are expert and free of bias. Mergers and acquisitions have taken a toll on minority-owned institutions and despite the development of the Federal Reserve System’s Minority-Owned Institutions (MOI) Program, the total number of designated “Minority-Owned Financial Institutions” has been on the decline. As of December 31, 2013 there were only 174. Many of these institutions provide access to credit and financial services in markets that have historically been underserved and as a group they play a unique and important role that extends beyond their particular markets. They are diverse in terms of their minority ownership (e.g., African American, Native American, Asian, and Hispanic) and the markets they serve. Some are quite profitable and operate in higher-income markets, while others serve lower-income communities and, in some cases, struggle to achieve earnings commensurate with their peers. African Americans, Hispanics and Asian Americans have increasingly looked toward financial institutions to help them build wealth, purchase homes, meet everyday needs and plan for the future. Minority-owned and de novo institutions that remain stable, operate in a safe and sound manner, and grow to a size that allows them to continue providing capital and financial services to a growing population add strength and vitality to the local communities they serve and help provide economic stability to the U.S. economy. Minority banks are important to the communities they serve and vital to many inner cities. Many minority banks also follow a mission to help communities that are challenged with demographic and economic weaknesses. These successful institutions have identified that importance of customers being able to communicate in their own language which is a particular focus of the minority owned Asian banks. After Spanish, Chinese is the most widely spoken non-English language in the country at about 2.3 million. The languages of Tagalog and Vietnamese are spoken by about 1 million. The Federal Reserve System has worked to support minority-owned financial institutions since congress enacted the Financial Institutions Reform, Recovery, and Enforcement Act of 1989 (“FIRREA”) section 308 which among others goals established goals to promote and encourage creation of new minority depository institutions; preserve the number of minority depository institutions and preserve the minority character in cases of merger or acquisition. The Minority Bank Deposit Program (MBDP) was created as a voluntary program by Executive Order to encourage greater participation by minority and women-owned financial institutions and credit unions serving low-income communities as depositaries and financial agents. In August, 2013, the Board of Governors of the Federal Reserve System reaffirmed their ongoing commitment to preserving the existence of minority depository institutions (MDIs), consistent with statutory mandates, and to highlight the Federal Reserve’s resources available to MDIs. These resources include the Community Development Financial Institutions (CDFI) Fund; Minority Bank Deposit Program; and Minority Business Development Agency. Today the growth market in banking is being driven in large part by the large influx of the vary people that FIRREA was developed to help. However as the minority–owned banks become successful they become likely candidates for a merger or acquisition often leaving a gap typically in the personal relationships between customer and banker and the services and products offered. Data compiled from the FFIEC website for the most current Peer Group statistics for total Minority-Owned banks as of December 31, 2013 are lead by Asian-Owned banks for a total of 87, followed by Hispanic-Owned banks at 39, African-American-Owned banks at 28, and Native American-Owned banks at 18. The services and products offered today and in the future must reflect the needs of a younger (GEN Y), more mobile and more ethnic customer base. Although both big banks and small banks are working to find ways to attract these consumers, it has often been the Minority-Owned bank that offers the personalized services and products that this group has been seeking in the past and may be the successful leverage for future Minority-Owned Banks in this country. Ownership and running of Minority-Owned banks will need to grow as these populations grow in the country. FIRREA defines a “minority depository institution” as any (either privately or publicly owned) where 51 percent or more of the voting stock is owned by one or more socially and economically disadvantaged individuals or in the case of a mutual institution where the majority of the board of directors, account holders, and the community it services is predominantly minority. The term “minority” is stated as any Black American, Native American, Hispanic American or Asian American. Community Banks have a critical role in keeping their local economies vibrant and growing by lending to creditworthy borrowers in their regions. They often respond with greater agility to lending requests than their national competitors because of their detailed knowledge of the needs of their customers and their close ties to the communities they serve. Such lending helps foster the economy by allowing businesses to buy new equipment, add workers or sign contracts for increased trade or services. Customer knowledge also gives community bankers a real-time understanding of customer demands and provides them with an opportunity to respond more aggressively to those demands – particularly in regard to the use of technology. Chartering a new Community Bank provides the opportunity for local investors to profit from high-quality services offered by a Community Bank, and strengthens the local economy through loans to customers. There is predictability to the ebb and flow of Community Bank charter activity. Every seven to ten years, since World War II, there has been a resurgence of new bank charter submissions and approvals. This is typically followed by a period during which mergers and acquisitions although leaving a gap in the community banking industry are often favorable to the bank’s shareholders. Many astute and successful individuals have been involved in community banks as Organizers, Directors or Investors. Many of these banks have found their niche in the local markets and as a result, their shareholders benefited with annual returns between 8% and 12%. 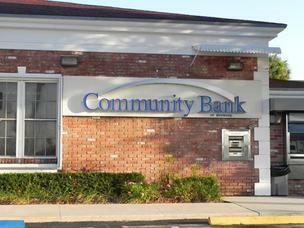 Well-capitalized Community Banks that are well-managed and strategically located will continue to prosper. In doing so, they can continue to be attractive investments, and lucrative ventures for the local economy. If recent mergers and acquisitions within your community have led to inferior banking service, dissatisfaction by consumers and businesses, and a significant decline in economic development and financial leadership, the opportunity may exist in your community for a new bank that can provide quality products and services and attractive returns for your investors. As many of you know I have been serving as the Executive Director of CREED – the Center of Resources for Economic Education and Development these past several years. This year we have done some exciting things with the help of our board and many of you. We have shipped over 1000 humanitarian school kits to children in need so they can continue their education in Haiti and Belize, and we are preparing a shipment to Uganda. We helped start a micro business in Uganda at an orphanage – we provided the funds to start a pultry business, we helped build a chicken coop stocked with baby chicks and feed. This chicken coop, which will hold 500 chickens, will help provide enough money in the future to send the 27 children to school as well as help them have more food to eat. We are starting a micro-business lending project in Belize which will provide small dollar loans to several micro business owners, after approval of the borrower’s business plan and education training. We now have a very unique opportunity: Just Give, a non-profit company, which offers non-profits such as CREED and thousands of other non-profits an easy way to donate on line, is offering a matching gift to celebrate their 10 year anniversary. For each donation of at least $10.00 they will send us an additional $10.00. This offer is only for donation made up to October 20th. A school kit cost $10.00. So for every ten dollars donated we can send two children to school instead of one! The micro business loans will be about $400-$500 each; we are working towards four loans per month in the next 12 months. On behalf of CREED and the growing number of people we serve, we thank you very much your support, it is GREATLY APPRECIATED. And we wish you the best as we press forward during these difficult times to strengthen families and homes, through self-reliance. Please join me in sending more children to school and also help finance a micro-business with a small donation. CREED is a registered 501(c)3 nonprofit and all donations are tax deductible. With the enactment of the Dodd-Frank Act on July 21st of this year, the FDIC was given the tools to resolve a failing financial company that poses a significant risk to the financial stability of the United States. We now have the framework in place to resolve any financial institution, no matter how large or complex. Implementation of Dodd-Frank is designed to end "too big to fail," and the new resolution authority is a major reason why it will do so. The orderly liquidation process established under Title II of the Dodd-Frank Act imposes the losses on shareholders and creditors, while also protecting the economy and taxpayer interests. If appointed as receiver for a failing systemic financial company, the FDIC has broad authority under the Dodd-Frank Act to operate or liquidate the business, sell the assets, and resolve the liabilities of the company immediately after its appointment as receiver or as soon as conditions make this appropriate. This authority will enable the FDIC to act immediately to sell assets of the company to another entity or, if that is not possible, to create a bridge financial company to maintain critical functions as the entity is wound down. In receiverships of insured depository institutions, the ability to act quickly and decisively has been found to reduce losses to creditors while maintaining key banking services for depositors and businesses. The FDIC will similarly be able to act quickly in resolving non-bank financial companies under the Dodd-Frank Act. This is a major new responsibility for the FDIC. As you know, on August 10th we created the new Office of Complex Financial Institutions to help ensure that we are always ready to meet this responsibility. The Notice of Proposed Rulemaking is one step forward in this process. The proposed rule is intended to provide greater clarity and certainty about how certain key components of the resolution authority will be implemented and to ensure that the liquidation process under Title II reflects the Dodd Frank Act’s mandate of transparency. With the US financial system now stable and healing, it is important to move ahead with rules to make clear how the orderly liquidation process would be implemented to restore greater market discipline and promote clear understanding among shareholders and unsecured creditors that they, not taxpayers, are at risk. The FDIC is consulting with the Financial Stability Oversight Council members in accordance with the Dodd-Frank Act. In order to provide some additional time for Council members to offer their views and allow further consultation, today's meeting will provide a briefing for the Board members. We plan to ask for a notational vote next week after the FSOC has had its first meeting. A special issue of concern during consideration of Dodd-Frank was how the FDIC might use its authority in a liquidation to pay certain creditors of a receivership more than similarly situated creditors if certain criteria are met. This proposal re-affirms that all equity share holders and unsecured creditors are at risk for loss and that the general rule will be that their claims will be processed in accordance with the priorities established under the bankruptcy code which are the same priorities that we use in our bank receiverships. The authority to differentiate among creditors will be used rarely and only where such additional payments are "essential to the implementation of the receivership or any bridge financial company." This cannot be a bail-out – that is clear from the statute. The NPR proposes to confirm that long-term bondholders, subordinated debt holders, and shareholders of a financial company will in no circumstances receive payments above their share to which they are entitled under the priority of payments in the statute. They can never be "essential" to the receivership or the bridge. This is consistent with the clear intent of the statute and we believe it is important that creditors have clarity in their treatment in a future liquidation. This is also consistent with the approach we have taken in our receivership process for banks. We have authority now to differentiate among creditors where it will maximize recoveries and have never found the need to use it except to compensate employees and other general creditors necessary to maintain essential operations. The other issues addressed by the NPR will, likewise, clarify how we will apply the liquidation authority in key, discrete areas – and provide important clarity to the markets. Equally important parts of the publication of the proposed rule are the background description of the orderly liquidation authority and the series of questions on which we are seeking comment for 90 days. The background information provided in the NPR gives an overview of the powers and different options that the FDIC may use in liquidating a large, complex non-bank financial company. We think this will be helpful to market participants who are less experienced with the bank closing process on which the liquidation authority is modeled. We look forward to comments on the broader questions posed in the NPR. Given the importance of the new liquidation authority – and the need for clarity in how it could be applied – the responses to the questions posed will inform a future, broader regulation to be proposed early next year to define key issues in the liquidation of large, complex financial institutions. As part of our public rulemaking, this NPR will facilitate communication between the FDIC and the financial services industry, as well as the general public, on implementing the new resolution authority. I look forward to the comments. BankNotes© is published by De Novo Strategy as a service to clients and other friends. The information contained in this publication should not be construed as legal, accounting, or investment advice. Should further analysis or explanation of the subject matter be required, please contact De Novo Strategy at subscribe@denovostrategy.com.